Configure automatic discounts for bundle options. Identify which quote line fields are directly affected by option discounting. Describe how option pricing interacts with other pricing tools to affect the Special Price field. If you’ve completed the Configurable Bundles in Salesforce CPQ Trailhead badge, you know that bundles are collections of products sold together as a set. They’re a great way to help sales reps remember what’s supposed to be sold together and what products are available for upsells. Have you ever come across a great deal on a bundle? Maybe it’s all three movies in your favorite sci-fi trilogy sold for one low price. Or maybe it’s a discount on the latest cell phone when packaged with a year of service. To encourage customers to buy bundles, businesses often discount the bundled products while leaving the unbundled products full price. Salesforce CPQ supports exactly this scenario, making it easy for administrators to set up bundle-based discounts. AW Computing sells a number of hi-tech products in bundles and wants to offer its customers a discount on specific products when purchased in a bundle. The Security Console is one such bundle. It’s a suite of products designed for office security, including things like security key cards, door locks, and keypads. AW Computing wants to offer a 10% discount on the Interior Badge Reader product, but only when sold in the Security Console bundle. You update the bundle option so the 10% discount is applied automatically. This is the Product Option specific to the Interior Badge Reader. That is all you have to do! Now let’s test our work by adding the Security Console to a quote. Check the box for Security Console. This brings you to the Product Configuration page because Security Console is a bundle. The Interior Badge Reader should already be a selected option. Here you see the quote line editor with all the products from the bundle. If we open the quote line drawer for the Interior Badge Reader by clicking the arrow on the quote line ( ), we see that the Special Price is $58.50, exactly 10% less than the List Price of $65.00. It’s easy for administrators to set up automatic discounts when products are sold in a bundle, and sales reps can see discounts applied without any additional work. In the last unit, you read about the price waterfall, the series of price fields CPQ uses to track quote line pricing. One field, Special Price, is used to represent option discounts. 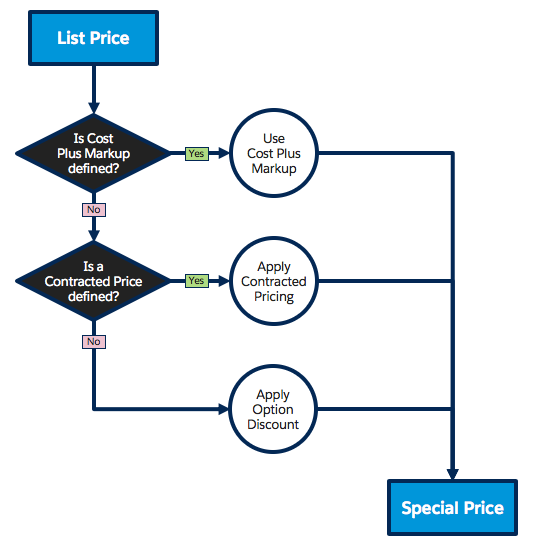 However, CPQ also uses the Special Price field to represent the outcome of cost plus markup and contracted pricing adjustments. So what happens if option discounts are used with one of the other pricing methods? Only one adjustment can be used for the Special Price field, so Salesforce CPQ prioritizes them. Cost Plus Markup has the highest priority. If that’s not used, then Contracted Pricing is applied. Lastly, if no other adjustments exist, the Option discount is applied to the List Price. Option discounting is an easy way to automatically discount products sold as part of a bundle. Another way to automate discounts is to use a tool called Discount Schedules, which lets admins set up volume-based pricing. In the next unit we see how to use Discount Schedules to reward customers who buy in bulk.